There was no doubt that this was a carnivore of some sort, given the sharp canines and the massive carnassial teeth. Most of you spotted that it was the skull of a juvenile or subadult, given the partially emerged teeth and the unfused sutures. 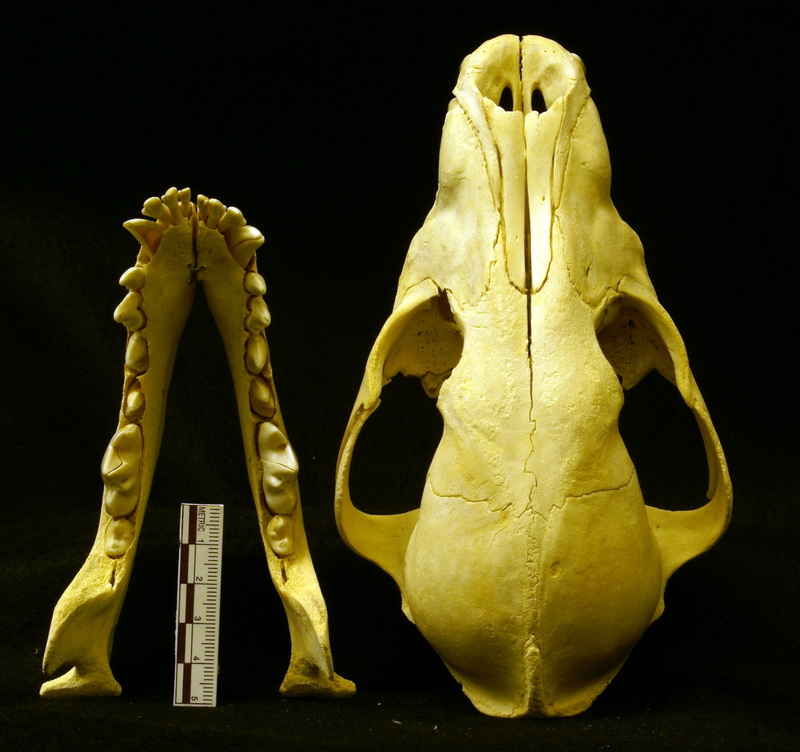 Most of you also spotted that it was a canid of some sort, given the overall shape and the tooth arrangement. Could I paint you a picture of this animal? This answer is a reference to the name of an African carnivore, the Painted Hunting Dog or African Wild Dog Lycaon pictus (Temminck, 1820). 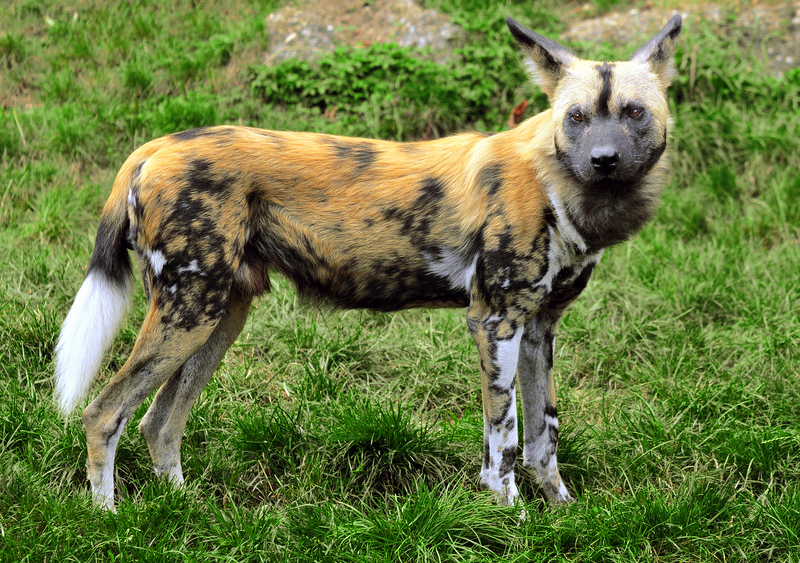 The scientific name means ‘painted wolf’ which is a reference to the blotched markings on the coat of these animals. These endangered pack hunters are scattered across Africa in ever-shrinking pockets, with numbers reducing due to human activities and infectious diseases – presumably including diseases communicated by domesticated dogs, like canine distemper. African Hunting Dogs are renowned as successful hunters, having a better kill rate than most other large African predators (more than twice that of Lions according to some sources). Of course, that may reflect that they are more picky about the prey that they’ll attempt to take in the first place, preferring medium sized antelope to the larger species – although they will have a go at animals up to the size of the notoriously dangerous African Buffalo. No wonder they need such impressive teeth. Even though their kill rate is way better than that of lions, I’ll bet people are more afraid of lions. It depends what’s included in the kill rate though – I expect lions have a far higher kill rate of humans than hunting dogs do, so there’d be a good reason for humans to be more afraid of lions! I was in Hluwhluwe-Imfolozi NP in SA in April and was lucky enough to see a pack of these amazing dogs. The local ranger has a story of a Nyala with a Painted Dog pack on its heals risking everything by diving into the visitor centre and cowering under a table. The antelope was more afraid of the dogs than the humans – says a lot about the dogs! The NP staff left the Nyala there for a couple of hours and then had to drag it out by its horns. Apparently visitors, unnaccustomed to what might be considered normal in a safari park, though it was “nice”.